A JetBlue pilot suffered an eye injury when a green laser was pointed directly into the cockpit as the plane was en route to New York's John F. Kennedy Airport. 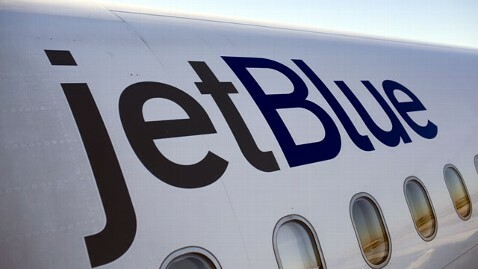 The FAA says the incident took place Sunday when the green laser was shone through the windshield of JetBlue Flight 657 from Syracuse, hitting the first officer in the eye. The pilot immediately notified the control tower after the incident. "JetBlue 657, that was about 5,000 feet, right?" the control tower asked. "Yes sir, 5,000 feet. Two green flashes, and it caught the first officer in his eye," the pilot said. An FAA preliminary incident report described the pilot's injury as minor but did not provide details. It was unknown whether the injured pilot was in command of the aircraft at the time, but the flight landed safely at JFK 10 minutes later. "Use caution. I just had an unauthorized laser illumination event about seven miles ahead of you at 5,000 feet," the control tower said. "JetBlue 657, we are looking into the matter." In 2011, there were more than 3,500 documented incidents of lasers being pointed at aircrafts, up from less than 300 in 2005. Two planes were reportedly targeted by a green laser beam in San Francisco last week. Those pilots were not injured. "What happens is that pinpoint spreads out as it gets up higher and farther away, and what may seem like a very faint light to you, in a cockpit, gets almost blinding," San Francisco International Airport spokesman Mike McCarron said. Authorities say they're ramping up their response efforts and pursuing stricter penalties. "Interfering with a flight crew is a federal crime. So, the FBI has looked into these laser incidents over the last several years," said Richard Kolko, special agent with the FBI. "We've located some of them. Several of them have been prosecuted." Laser pointers are also subject to state laws in some cases. A Massachusetts man was sentenced to three years in prison in 2011 for shining a green laser at a Massachusetts State Police helicopter in 2007. A California man was sentenced to 2 ½ years in federal prison in 2009 for aiming a laser beam at two planes as they were about to land at John Wayne Airport in Orange County.